Interesting confluence of influences this weekend. 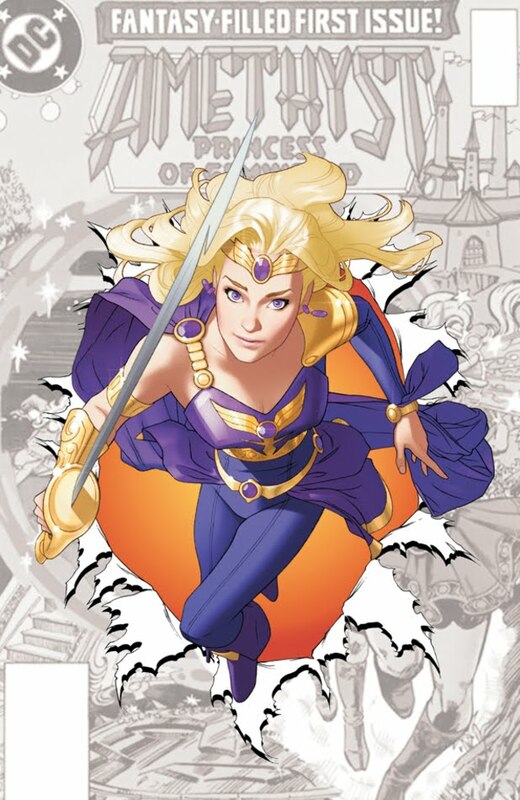 Evidently, on Friday, it was revealed that the upcoming Sword and Sorcery from DC will see the return of Amethyst, The Princess of Gemworld. I say "evidently" because I didn't hear about it until Saturday when the S.O. said something about it. She had read about it on io9, completely independent of anything I might've said. She's not really a comic fan by any means, so it was kind of cool that she learned about comic book news from somewhere OTHER than me. I'm familiar with Amethyst primarily from my ex-wife. She had, at one point, mentioned that was one of the few comics she read as a kid, but had trouble finding all the issues and got frustrated with the story because of it. It was one of the few comics she could relate to, as it was one of the few that had a strong female lead. It was one of the few comics that featured a protagonist where she could say, "That looks like me." After I discovered this, I tracked down all the issues in the various iterations of the title as a gift. ... and said, "Another character that doesn't look like me? I'm done already." I'm sure a number of people are looking at this move by DC and saying, "A strong female lead! That's awesome!" But it's not. Not really. The character is just as Aryan as Captain America. It's Barbie in a purple Wonder Woman costume. With backup stories featuring another white male hero, Beowulf. This isn't progressive. We're talking about a character who titled three separate titles back in the '80s, none of which had backup features. She's in half of a generically-titled comic. That's considerably down the ladder from where she was. And, as I noted, she's still pretty darned Aryan in the first place. Now, to DC's credit, Team Seven looks to have a diverse cast. But here's the thing: EVERY BOOK SHOULD HAVE A DIVERSE CAST! When you go to work or the store or the park, there are more than just Caucasians there. EVERY BOOK SHOULD HAVE A DIVERSE CAST! That reflects the reality we live in. I don't want to judge Sword and Sorcery sight-unseen; it might be very well done. And that it's not directly squarely at DC's usual Wednesday crowd is different. But it shouldn't be! It should NOT look like an outlier book and, more importantly, there should not be so few books with a female lead that this and Wonder Woman have to be asked to represent all women. 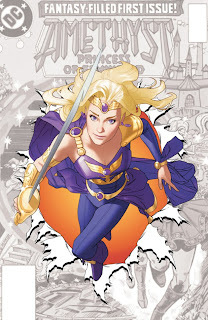 There's nothing wrong with publishing new Princess of Gemworld stories. But don't expect one title that looks a lot like Wonder Woman to broaden your approach to diversity. Especially with DC rebooting everything, why not make Amethyst black? Or Latina? Or Asian? I'm sure there's a contingent of old fans who want Amethyst to remain a blonde, Disney-esque princess but weren't there fans who thought Alan Scott was a heterosexual? The more DC gets into their big reboot here, the more it looks like their old stuff. Maybe DC's thinking is Amythest wouldn't be marketable if she were completely different. This is a character I would think is pulling on nostalgia seekers first and new readers second. Perhaps what DC should have done is introduce a supporting cast that would be diverse. Also, shouldn't a cast be made diverse because it fits the story- not just to be diverse or to look like a world it doesn't take place in? Good post. If there's one positive result of the lameness of DC, it seems to be inspiring some excellent commentary; I thought the Robot 6 blog post on this and the related announcements approached tour-de-force level.